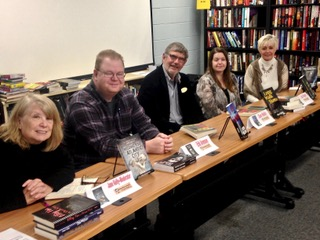 By return invitation to the Muhlenberg Public Library in Berks County, PA, Moderator Jane Kelly (left) leads fellow MWA mystery writers Erik Arneson, Don Delin, Lisa Regan and Nancy in a lively discussion. 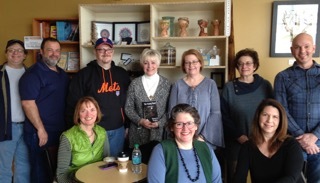 The librarians and their patrons are such gracious hosts, engaging the panel with thought-provoking questions about their novels and the crime-fiction genre in general. We can’t say enough about the value of libraries in our communities! 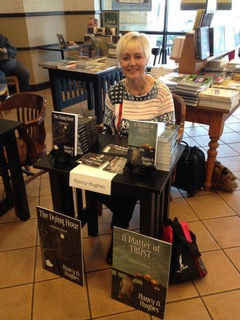 The Wyomissing, PA, Barnes & Noble graciously hosted a Local Author Event the weekend of November 18 and 19. 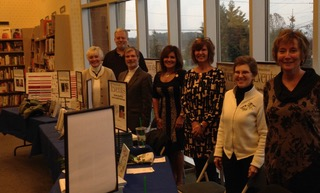 Seven authors, with diverse fiction and nonfiction titles, greeted customers who came to this well-publicized event in spite of torrential rain and high wind. 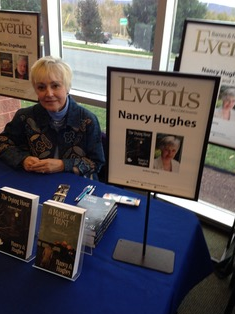 Lancaster PA Barnes & Noble graciously hosted Local Authors Event on November 4. 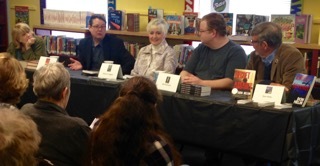 Panelists respond to author-moderator Dennis Royer’s questions—“How do authors manipulate their characters to get the story they want?” Barbara Early (with puppet), Don Helin, Nancy, and Jane Kelly spun answers to 40+ mystery lovers. Speed dating with Nancy. Panelists chat with conference attendees, like three-minute games of musical chairs. 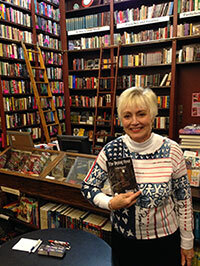 Visit the Mechanicsburg Mystery Bookshop online for exciting events, presentations, and crime fiction’s best titles. And watch for the Murder As You Like It seventh annual conference in 2018. 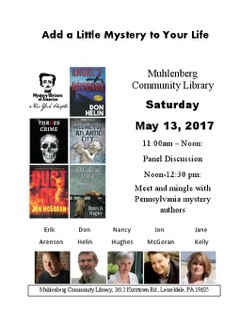 Nancy participated in a Panel Discussion with other Mystery Writers of America, authors on Saturday, May 13, 2017, at the Muhlenberg Library Muhlenberg Community Library in Laureldale, PA.
Moderator Jane Kelly elicits lively discussion among fellow MWA authors (l to r) Jon McGoran, Nancy, Erik Arneson and Don Helin. 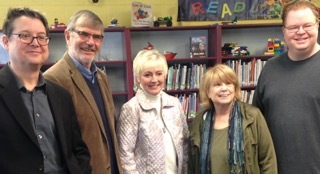 Muhlenberg Library’s gracious staff and their Mystery Readers Club welcomed us with enthusiasm and great questions. 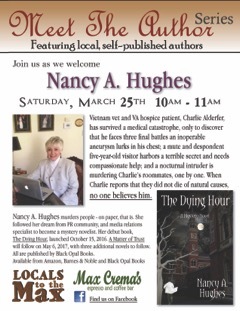 Nancy launched The Dying Hour mystery novel on Veteran’s Day, November 14, 2016. 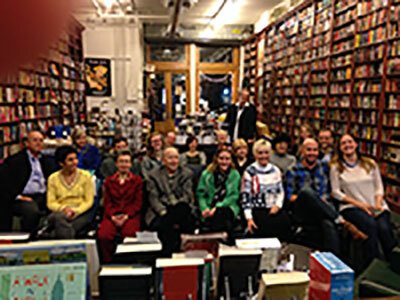 Launch event and Book signing at the Mysterious Book Shop. 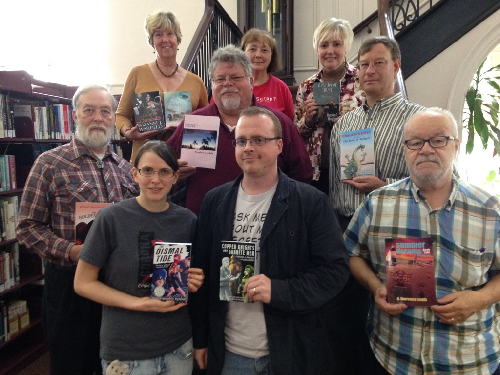 Many thanks to the Pottsville Free Public Library for hosting Indie Author Day in October 14 2017. The library is amazing, and their staff so gracious and helpful. Front row, l to r: Michelle and Michael DiBaggio, George L. Smith. 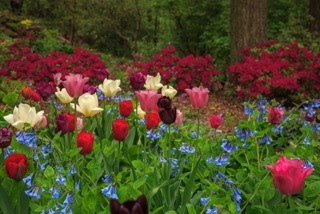 Second row, l to r: Wes Loder, Stephen Goodale, Alfred Wohlmuth. 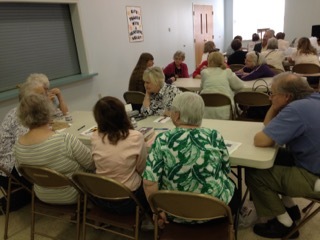 Back row, l to r: Anna Getz, Suzanne Warfield, Nancy Hughes. Not pictured: Kenny Kahn Kilpatrick. Looking for a good read? 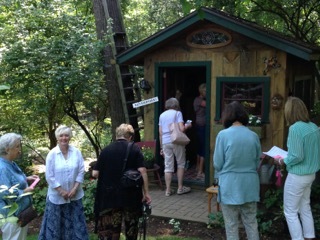 Try these creative local authors. ©2019 Nancy A. Hughes. All Rights Reserved.